Just like in humans, the airways in cats with asthma become restricted and inflamed. Mucus forms in the respiratory tract and the airway walls spasm. This can lead to wheezing, coughing, tiredness and difficulty breathing. Some cats can also vomit or lose their appetite. A cat having an asthma attack may sit with his head extended and breathe with an open mouth. Open mouth breathing is abnormal in cats. If you see this, consider it a sign of emergency and contact your veterinarian immediately. So far as we can tell, any cat has the potential to develop asthma. The underlying cause remains unknown, though some veterinarians suspect allergies are involved. The signs of asthma can mimic those of other respiratory diseases, such as feline heartworm disease, bronchitis, pneumonia or heart disease, so it is important to get your cat checked out as soon as possible if he or she develops clinical signs. Also be aware that your veterinarian may run a couple of basic tests as well as chest X-rays to rule out other conditions, as asthma can be difficult to diagnose. An X-ray of an asthmatic cat may show an abnormal pattern in the lungs, but only if in the throes of an attack. As in humans, there is no known cure for feline asthma. Treatment focuses on treating and preventing asthma attacks. Medications, such as steroids and bronchodilators, are used to make breathing easier by reducing inflammation and opening up the airways. Severe asthma attacks are considered a medical emergency. If the attack is severe, your cat may be hospitalized and given oxygen to help him breathe and reduce stress, because just like in humans, panic can worsen the attack. As a holistic veterinarian, I’d like to see more use of alternative remedies, like homeopathy, herbs and specific nutrients. It is my personal feeling that asthma can be best managed with both traditional and holistic medicines. Some herbs are known to have anti-inflammatory properties which can help to support healthy lung tissues. I encourage pet parents to work closely with their regular vets and find holistic vets to use for valuable second opinions and non-traditional insights. Since many veterinarians believe that there is an allergic component to asthma, try to remove inhalant allergies from the home through use of a HEPA filter and air purifiers. Consider using lidless litter pans and low-dust litter, along with minimizing your cat’s exposure to dust, aerosols, smoke, or other airborne irritants. 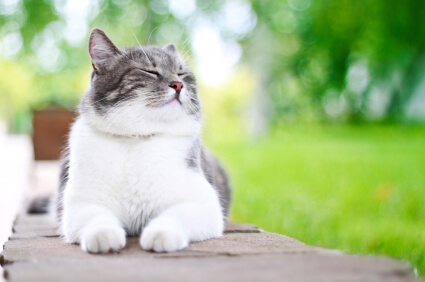 Do everything you can to help your cat be calm if he is experiencing difficulty breathing. Many times, just by staying calm, an asthmatic flare-up can pass. However, if you notice open mouth breathing or if your cat’s lips, tongue, or gums are turning bluish, call your veterinarian immediately. Managing asthma in cats requires a strong partnership with at least one veterinarian you trust. With proper care, many asthmatic cats live long, happy lives. If you notice any of the above signs in your cat, be sure to talk to your veterinarian. Dr Jane, I'm interested to know more about the herbs and specific nutrients you mentioned. I don't know of any asthmatic cats, but I'd love to have the information in case the topic comes up. I recommend you talk to your holistic vet about natural remedies to control lung inflammation and promote respiratory health in your cat. Holistic and integrative veterinarians use naturally dried plant sterols and sterolins. They also use homeopathics and Chinese herbs to help manage many cases of feline asthma. I also encourage you to consider acupuncture. Acupuncture has been proven to help reduce systemic inflammation in a cat's body. It can also help reduce the frequency and intensity of asthmatic episodes. In addition, there has been a lot of success with cold laser therapy helping to reduce inflammation in many areas of the body, including lung tissue. In traditional vet medicine, there are a wide variety of drugs used to treat feline asthma, including bronchodilators and specially designed steroid inhalers. Vets often start with one or several of those drugs to manage a severe case of feline asthma. If your cat is taking drugs to control asthma, my advice is to work with your holistic vet to wean your cat down or off of some of these medications. It's possible to manage kitties with respiratory disease without using drugs, but unfortunately, in some situations cats with life-threatening asthma symptoms require at least some drugs to save their lives and reduce the intensity of attacks. Great article. Is asthma in cats caused solely by environment factors or could it be genetic? Also, is there any evidence of cat food ingredients like corn and soy contributing to asthma (allergens)? My 10 year old female cat showed her first signs of asthma about 7 years ago. I have a Hepa filter, an open litter box with low or no dust litter, use no aerosols in the house, no longer have candles and feed her a dry food that has no fish, as recommended by her Vet. Also, I have discovered a homeopathic product for cough/asthma. I add drops of this product to her water everyday. She is doing quite well with occasional mild episodes of difficult breathing. I am hoping that this product is playing a part in her wellbeing. I would like your opinion about fish in cat food, as it relates to feline asthma.